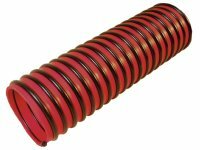 A flexible conductive hose designed to allow for safe grounding during wet and dry material transfer operations. This hose is lightweight with a smooth interior for optimum flow. Conductivity of hose should be tested regularly. Test with OHMS meter using conductive fittings inserted into each end of hose.